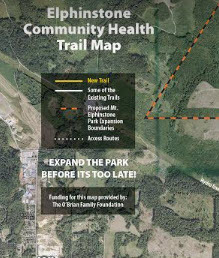 We are pleased to publish the latest version of the Sunshine Coast Community Health Trail Map v2 with a new trail head added. Trailhead #1: drive up B & K Rd (past powerlines) and keep driving in a north-east direction past the first turn-off (Roberts-Flume FSR). Within 2-3 mins. begin looking for a pull-out on the right handside and park here. Look for a Health Trail sign in parking area providing directions to trailhead. ut 2 mins. and looking for Health Trail sign on the left. 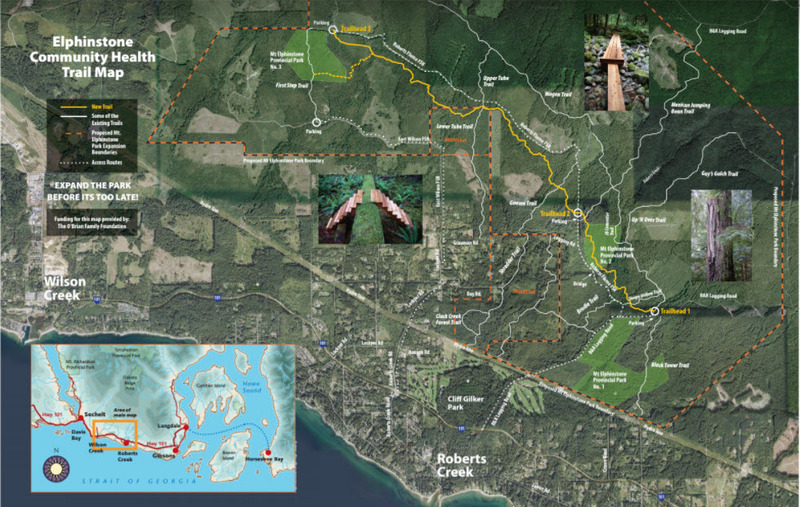 Trailhead #2: turn off B & K Rd at the Roberts-Flume FSR, traveling in a north-west direction. Cross a bridge that goes over Roberts Creek, past an old gravel pit and follow road as it turns north. From gravel pit travel approx. 2-3 mins. watching for Health Trail signage on your left. Park above or below the sign and walk in.